What is the maximum carrying capacity of my forklift to a given lift height? The load carrying capacity of a forklift is indicated on the capacity data plate or name plate and should be found affixed to the forklift in a prominent location in view of the operator. OSHA safety regulations state that a forklift must have a legible capacity plate. This data plate will indicate the maximum lifting capacity of the machine to the full extension height of the mast and a specified load center for a given configuration. If the forklift configuration or the load characteristics have changed since the data plate was issued, if the data plate is unreadable, or if there are special new load handling conditions, a capacity plate should be changed or added to reflect the relevant forklift, attachment and load conditions. This is extremely important because a warehouse manager and a trained forklift operator will first look to this data plate and rely on this information for the maximum load that can be safely handled with the machine. A forklift attachment includes anything that is attached to the front carriage of a forklift or is attached to an attachment on the forklift. A typical forklift attachment configuration might include a hang-on side shifter and two forks. In this case, if the forks are removed and longer forks are added, the capacity of the machine could be drastically reduced. Or if the forklift is used to pick up a fork mounted attachment, such as a drum handler or fork extensions, then a capacity data plate must be changed or added to reflect the new configuration. 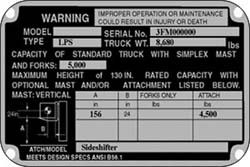 OSHA safety regulations state that a forklift must have a legible capacity plate to reflect any attachment used on the lift. Because a forklift is using leverage to lift a load, any condition that adds weight to the front of the forklift and causes the load center (LC or CG) of the load to be moved further away from the forklift will contribute to a reduction in the residual carrying capacity of the machine. Attachments can cause these reductions, as well as the dimensions of the load and the load handling conditions. Load center typically refers to the horizontal distance to the load CG and is typically half the length of the load for symmetrical objects. To illustrate how attachments and load CG’s can affect residual carrying capacity, consider for example that a particular forklift with only forks on the carriage is rated at 5,000 lb capacity @ 24” load center on the data plate. This forklift will only be rated at 1,270 lb when equipped with a particular 8 foot long fork mounted jib boom because the boom adds weight and moves the load center out to 96 inches. In this case the forklift may employ a dual load center capacity rating on the capacity plate indicating a greater lifting capacity (2,750 lb) at a 4 foot load center and a lower capacity (1,270 lb) at the 8 foot load center. The main thing to consider is that every forklift has a legible capacity plate that accurately reflects the attachment configuration being used at the correct load center for the load being lifted and contact Professional Forklift Engineering Services at http://www.forkliftcapacitycalculator.com/ to check your lift capacity and get a professional engineering (PE) certified capacity rating plate on your forklift today. This is a great article written by Edward Brown, Editor of warehouseiq.com. They have many great articles on warhousing and lift trucks. Lift capacity, I believe is one of the most important things to always have in check. Never risk overloading, it's one of the leading causes of accidents.